Jugaad1 (Innovation) Lab is an out of the box and inspiring initiative of Feminist Approach to Technology (FAT), which creates a much-needed space for girls from disadvantaged communities to kindle their interest in Science Technology Engineering and Mathematics (STEM) fields. This space more popularly called ‘the lab’ for girls is a place which sparks their imagination and aids their intellectual growth and development; a place where they can tinker, build, break and rebuild stuff to learn through hands on work and experimentation, all the while also learning STEM concepts. The lab was started as a pilot project in the beginning of 2015 in Lajpat Nagar, New Delhi with 8 participants and today we have a total of 20 participants from ages 10 yrs to 15 yrs, mobilized from government schools and low-income communities near Lajpat Nagar, New Delhi. The lab has regular two/three hour classes everyday in the afternoon where a study schedule is followed. New concepts of STEM are introduced, new projects are initiated and completed and after that, informal sessions on school work, issues at home etc are also discussed. The classes were designed after understanding their school curriculum of Science and Math from class 6th to 8th so they could help them in school as well. We use tools like videos, projects, books, worksheets, games, activities and model-making to build their understanding around STEM subjects. We also organize exposure visits to different makers-spaces, museums, exhibitions, science fairs etc. in Delhi so that girls can understand science application as well as get to use the equipment used in professional labs to get over their fears and inhibitions. After ten months of attending the Jugaad Lab, there is a visible change in the girls. They now understand science and math concepts and love making new projects. Initially, the team had to push them to learn new things, now they come up with their own ideas to make things. They started with basic projects like photo frames and origami and now are building their own lamps, electric table fans, electric bells, DC motors, and many more. The Lab has become a place where they feel free to think, create, make, break and have fun as they learn. The girls enjoy the classes so much, they don't want to go back home. The participants also have become the mouthpieces of the project and even encouraged their friends and relatives to join the Lab. Today, they proudly tell their teachers, family and peers about the new things they learn in class, and even recreate what they made that day at home. The sense of ownership and the lab being their space is so strong that during their exam months, they use the lab to study as well and take help from the team to understand lessons better. Today they are bending the stereotypes of gender by igniting their minds to think scientifically, not only to learn but also to help their community. This summer they took part in a Hackathon and identified community problems and developed the solutions to it through new concepts of science. The girls identified four such problems and worked on two of them. One was to design plastic disposal bins for sanitary napkins, install them in the community toilets with directions to use. 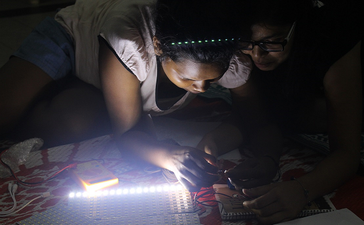 Second was on making solar lamps to resolve the lack of street lights. When asked by the facilitator to narrate an incident on how they use what they learn at the lab, Sanjana narrated an incident where the TV was not working at her home and everyone thought it needed to be repaired by a mechanic. Sanjana checked the plug and saw that the wire connections inside it were loose. She re- connected the wires and the plug and TV started working again. Initially, participants were from classes 8 and 9 (13-14yrs), keeping in mind that this is the age when students have to decide what stream they are going to study in after 10th and hence, we felt it was important to work with this group. We conducted several basic science and maths workshops and classes but faced a lot of issues with this batch. As per the age group of the girls, parental pressure, language issues, restricted mobility, were some of the major challenges, so we decided to change our strategy to inducting younger girls, ages 10 – 13 yrs. Another issue we face is convincing the parents that the Lab is beneficial for the girls. They look at it as a hobby class and want their children to focus on tuitions, religious school and other classes more. During the exam break, the Jugaad Lab team made multiple visits to the girl's homes to understand the challenges that girls face in their daily lives, their interest in the Lab and build the support of their family members so they continue to send the girls to the Lab. The safety of the girls while traveling to the Lab is another major concern. Despite the fact that the classes end before it gets dark, some girls face issues traveling alone. Arranging a van for them has not been possible due to lack of funds. Since the project is human resource intensive we need to invest in developing a larger team for the Lab. Till now, we have been dependent on volunteers, but we lack stable resources. The rapport building with the teacher takes time, and the girls find it difficult to adjust to new people very easily. Jugaad – a colloquial north Indian Hindi word meaning - innovative fix, a simple work-around, solutions that optimize use of resources by bending norms. Be a sponsor for these girls. Raise funds for them. Volunteer with us Sponsor activities at the lab. What is the ask: The team of FAT has developed a space called Jugaad Lab for Girls in Lajpat Nagar, Delhi. It is space that is built to hold classes of the lab. Now we need to raise funds to sustain and continue Jugaad Lab for Girls in Delhi and maintain the infrastructure of this safe space for girls. So for two months this year (November and December) we are aiming to raise Rs. 10,00,000 (Ten lakhs) for the Jugaad Lab. How is this place different? Here’s a glimpse to how this space is different from other maker spaces and the girls here also understand and voice that. Why do we need a space like this. What difference is it bringing in the life of these girls? While explaining the concept of atom and electricity through an activity in the class, three participants were asked to become electron, proton and neutron respectively. The proton & neutron were asked to stay together while electron was asked to revolve around them freely, it had the liberty of moving to other atom. As they acted this out, one of the participants suddenly exclaimed that the proton and neutron are like her mother and she, who stay at home, whereas, her brother moved freely like the electron. Once this connection was made to their lives, the girls never forgot the concept of atom. They now use this analogy to explain circuits and how electricity flows. This discussion also interestingly triggered a discussion on gender norms and its impact on girls’ development. Another day, all of a sudden, Supriya and Sanjana’s mother arrived at Innovation Lab just to see what her daughters were up to. Both the girls showed their mother the electric bell they had made at the lab and demonstrated how it works. Their mother was astonished and speechless after seeing that. She also appreciated their work. Human resource - mentors for the girls to help understand concepts, finish a project, work in a practical setup, and talk to. We are looking to support at least 10 mentors through this process. Sponsoring a little innovator – these girls who come into the Lab are the little innovators, young girls who want to learn and empower themselves through experiential learning. This experiential learning is possible only when they can motivate their families that they do have potential. It will be infinitely easier for them to do that if they have a backer, if someone is willing to go an extra mile to see her innovate. We are looking to get sponsors for all 20 little innovators. Sponsor a class – every day at the Lab new concepts are unraveled and learned through experiential hand on demonstrations. This means, everyday during lesson planning, the facilitators need to buy simple things like strings, plastic balls, wire meshes, match boxes, chart papers and markers. Some classes need complex things like ply boards, saws, plastic gloves etc. Sponsor an exposure visit - once a month; the girls are taken for an exposure visit to a place of relevance like the science museum, maker space and other professional spaces dealing with STEM. These visits reassure the girls of the relevance of their journey at the Lab and also open their eyes to the larger issues. Sponsor a Jugaad Lab exhibition – the girls at the lab over time have developed some innovative projects and materials which they would want to go back to the community and other maker spaces to showcase. This is an action exhibition, where the girls exhibit their projects, explain it to the audience and also do short workshop modes to demonstrate what other things they do at the Lab. This is one of the ways of advocating for mainstreaming STEM education within the lives of the girls and to get more and more women to enroll into the Lab as well. Sponsor a winter camp and summer camp– every six months, especially during the school break, FAT organized a seven day long workshop/camp/hackathon, where the girls are oriented to think differently with STEM and use their current level of knowledge in doing something to bring back to the society and community where they live. So these girls over seven days, ideate on issues and challenges of their community and what they can do to address them, through the knowledge and hands on experience they have gained at the Lab. The workshop also brings in external facilitators and resource persons from other maker spaces communities who can assist the girls in developing new projects. This includes her transport, material cost of projects at the lab, internet time for online surfing, copies, pens, chart papers, etc. This is a two hour class, three times a week, for three hours for 20 girls (single batch). This includes class material cost, human resource cost and infrastructure cost – electricity, water, rent. This includes hiring of a bus for transportation, entry ticket to establishment, food, snacks, medical emergency kit, documentation and staff time. “Todo Bandishen” is the final product of an eight month long workshop with 31 young girls who live in the “bastis” around Lajpat Nagar, New Delhi. The theme “Early and Forced Marriage” was chosen by the girls in the second level of FAT’s Young Women’s Leadership Program as a common issue that they face in their lives. The participants made a collaborative film on the issue and used it for awareness building in their communities. Todo Bandishen revolves around the story of five young girls; each of whom have faced and fought against EFM in their own way. The five ways we chose to depict the issues of EFM were showing the effect on their Education, Health, Livelihood, ability to fight against Violence, and Choice. The film ends with each of the girls collectively walking into the light; symbolizing the fact that only their victory will lead society from darkness into light. At FAT we see women’s relationship with technology in three different ways, and thus emerge our thematic areas of work as well. Women as users – Technology, today, has become a basic necessity around the world. And still majority of women in India are denied access to basic technology. We believe that access to technology lead to equal growth opportunities for girls and women. It encourages them to take an active leadership role within their community and hence promoting greater gender equality. Our work in this area comprises working to develop leadership of adolescent girls and young women from disadvantaged communities through innovative use of technology as part of the Young Women's Leadership Program. We also work with grassroots women’s rights activists to improve their usage of tech tools in their work. Women as creators/makers – It is a fact that women from economically and socially disadvantaged communities have a limited or negilible access to a career in STEM (Science, Technology, Engineering & Mathematics) fields. At FAT we believe that if we want to effectively close this gap in STEM fields we must invest in making STEM education and experimentation accessible for girls and young women from socio-economically disadvantaged sections. The focus of our Girls and STEM Program is to understand and counter the challenges that restrict girls from disadvantaged backgrounds from gettting STEM education and entering STEM fields. Women as decision makers – Women’s voices are almost absent within the various sectors of technology. Hence, it is important and essential to ensure the inclusion of women’s voices in decision making around science and technology, whether at home or outside, to ensure that women are equal participants in the future of technology. This can be achieved only when a larger movement of including women’s opinions in technology is fostered through the cooperation of all stakeholders. Through our Advocacy Initiative, we aim to engender the conversation around women and technology in different forums, network with various organizations to increase the efforts to build this consciousness, and explore the various ways science & technology intersects with women’s rights. Feminist Approach to Technology (FAT) is a not for profit organization that believes in empowering women by enabling them to access, use and create technology through a feminist rights?based framework. We believe and promote an outlook that questions and critiques the existing structures of technology and seeks to incorporate women as equal partners within it. FAT was established in 2008 and primarily operates in Delhi. We are now expanding in the states of Rajasthan, Maharasthra ,Jharkhand and Bihar. The mission of FAT is to empower women by enhancing women’s awareness, interest, and participation in technology. We work towards this by breaking societal stereotypes and attitudes, encouraging and enabling women to feel capable and comfortable in working with technology, and collaborating with other women’s organizations to mainstream the issue of engendering technology. FAT envisions a world where the use and creation of technology is gender neutral. This is a world where all women have equal opportunities to learn, use and create technology, irrespective of their academic background, economic status or geographical location; an environment where women are not intimidated by new technologies but rather have an open mind to experiment with and benefit from them.